Good news! So I will mark this dpf as 'supported'. Can it be powed over USB (without batteries)? Do you think it's possible to mod the firmware for landscape mode? P.S. excited about the new dpf-ax version, will definitely flash and test! > definitely flash and test! Till now I was only using this frame without batteries. All the time (even for flashing) only powered by the usb cable. I've tried the frame with fw_disp_pearl_landscape.bin works in landscape mode, but the menu and the splash is not visible/usable. An update and a good news, it actaully works nicely with fw_disp_pearl_landscape.bin. In the previous try I forgot to restore the original firmware first and went directly from fw_disp_delightdigi_black_portrait.bin. The splashscreen, menu and the display are working. Could you take a look at this frame? This is a request from raspberry-pi forum user, Norefall. Can't find the flash info, please add its info to flash libary accordning to the flash ID. > Please try this fw. The firmware dump is here: http://shark.arktronic.com/picframe-full.bin and its MD5 hash should be d19a80d1eda22dad909b3a980b7008f9. @superelchi ~ could you please compile a disp version for this? Your dpf is already supported in the newest (currently un-committed, see above) release. Please use attached fw. Hi superelchi, can you help me. Btw: your dpf is compatble with "abeyerr_black". Flashing "fw_disp_abeyerr_black.bin" should work. Tk you superelchi, worked like a charm! FYI: new version is out. See here. But now i can't know what is needed to do..
Is my 1st time doing this. Did you use build-dpf-lcd4linux.sh? That will do all the work, including downloading svn 1142 of lcd4linux and patching it with lcd4linux-svn1142-dpf.patch, and configuring for driver DPF and invoking make. 0.11.0-SVN-1092 is the wrong version. You are using lcd4linux from your linux distro? Edited 1 time(s). Last edit at 10/17/2012 08:13AM by ax206geek. Now i tried to compile but i got a error. Gerado cópia de trabalho para revisão 1142.
make: *** Nenhum alvo indicado e nenhum arquivo make encontrado. Pare. I download again with that script, and it worked! Hey guys I have been following the guides in this forum trying to hack a DPF. I have downloaded dpf-ax (3.2) and following various problems finally managed to get everything compiled. I eventually managed to get a firmware dump but identify.py fails to find a matching DPF. but when i tired the firmware that superelchi posted (fw_disp_27893) for him all i got was a corrupted image and pressing the buttons failed to bring up the menu. I dug some more in this and the raspberrypi forums and got better results using fw_disp_blue, the image of the eyes appears to be wrong; they appear to be at a strange angle but the menu works. I have managed to get a display using lcd4linux but it doesnt look right and there is a border on the top and left of the screen with random pixels. I'm guessing this is a revised version of a compatible frame and isnt quite working as it should. Please upload your firmware dump. as requested please find enclosed the FW dump from my DPF, it's 2MB so I've had to compress it to be able to attach it to the post. 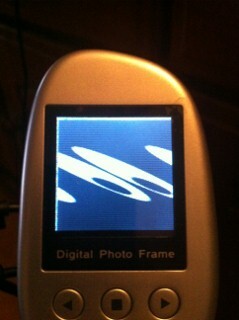 Also I attatched a photo of what happens when using the fw_disp_blue firmware. Notice the border top and left and the crooked eyes. struggled to flash this firmware via linux so ended up using progspi on windows. The eyes now appear correctly and the screen looks a lot better when running lcd4linux. I just need to work out if i can connect it to my asus n16 router. I cant thank you enough, but i'll try... thank you thank you thank you, thank you^infinity. FYI: new model "sevendayshop_pebble" comitted.